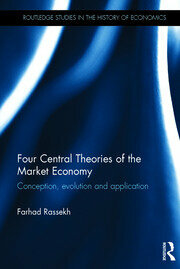 Farhad Rassekh a professor of economics at the University of Hartford. In 2007 he received the University’s James E. and Frances W. Bent Award for Scholarly and/or Artistic Creativity. His research areas include international trade and history of economic thought. He has published numerous articles in academic journals including in the American Economic Review, Review of Economics and Statistics, Economic Inquiry, and History of Economic Ideas. I have been teaching economics since 1983; six years at the University of St. Thomas and since 1989 at the University of Hartford. I have taught courses in international economics, managerial economics, business and society (an MBA capstone course), and public policy. Personally, I have been married since 1979 and have three children and three grand-children. My main areas of expertise and research are international trade and history of economic theories. I have published numerous articles in academic journals including the American Economic Review, Review of Economics and Statistics, Economic Inquiry, Review of International Economics, Quarterly Business Ethics, Journal of Global Ethics, and History of Economic Ideas. I am deeply interested in history of science in general and of economics in particular. What I find fascinating are the influential theories (both in economics and other fields) that emerged in the seventeenth and eighteenth centuries and led to the modern world -- theories that continue to shape our lives.